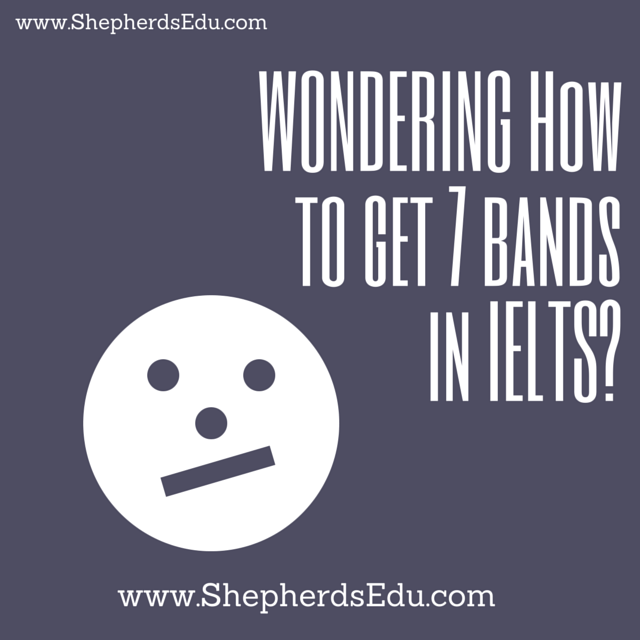 How to get 7 bands in IELTS? International Development Program (IDP) and British Council conduct an INTERNATIONAL ENGLISH LANGUAGE TESTING SYSTEM popularly known as IELTS is gaining popularity over past few years. It is an English language skill testing system that checks the individual’s command over the language that comprises of reading, writing, listening and speaking. These four modules are equivalently important when it comes to scoring a good 7 bands in the IELTS exam. All four sections have different tricks to pursue but have a basic key factor and that is practice and more practice. In this respect various practice books and online practice material is also available that helps to crack the exam by scoring at least 7+ bands in each subject. How to get 7 bands in IELTS ? In initial stages choose a particular category .Read all the tips and tricks about it and then go through few practice tests. It would help in accessing how well one can proceed further with the preparation. If you’re not scoring well in the practice tests, then don’t lose hope. There may be few more aspects to work on in each section. Firstly, lets discuss about the reading section. It seems quite an easy deal as this is what we are used to from our school level. We used to read our subject books but reading in IELTS is little different. Here we have to answer various questions based on the topic that requires concentration and good memorizing skills. This section can be worked upon by reading English newspapers , novels a should try and also some research journals in various fields. One should try to increase the speed and understand as well as memorize as much as one can when reading a certain passage. This will prove a great help in improving the reading skills and one will see a gradual improvement in this section. Secondly, the listening section comprises of various conversations amongst two or more people that needs to be understood and is side by side accompanied by answering the questions. Here you need to be fully focused on what is being talked about as a little lack of focus may take away your bands.So for making that easy one should listen to English news or watch English movies in order to have a better understanding of accent that is being used by the speakers. So once that skill is mastered you can score good bands in this section. But the key factor to master this module is focus and just focus. As the understanding of pronunciations gets better this module becomes easier. Cohesion works upon the principle of using words and phrases to show the interlinking of ideas. Coherence is a factor that helps in making your ideas well-understood by the reader. Composition comprises of giving some ideas or a real life example and then finally a conclusion . These all four factors help in delivering a great essay. For letters you just need to be aware about what is being asked and write accordingly, but, correct grammar and vocabulary are important as well. They are more important while writing an essay but also prove useful for letters as well. So all the four put together accurately cannot stop you from scoring good bands in this section. Avoid writing long sentences as they can be a source of errors mostly grammatical ones. Last but not the least , the speaking section has a division of 3 sections that test your speaking skills when put to different situations. It comprises of a general introduction about yourself and questions based on that. Furthermore, a topic will be given to speak on followed by set of questions related to that topic. So relax and speak as confidently as you can. Confidence is the key factor for nailing this module. If you are not able to answer confidently you may lose on your bands as you are not able to demonstrate the level of language you are capable of. The assessment of your speaking is judged by your fluency and the clarity with which you present your ideas without taking pauses. The range of words and accuracy of vocabulary you choose is also very important . Reduction of grammatical errors and use of correct pronunciations is a milestone in achieving great bands in this section. Maintain an eye contact with the examiner as this shows your confidence level and is appreciated by the invigilator as well. SO, these are few tips and tricks that can be of great help if worked upon carefully. But practice has no alternative. As they say “practice makes a man perfect” and nothing is impossible if we work hard in achieving it. A methodical approach and working on weak links can really take you to the goal that you want to achieve. And if you’re looking for the BEST IELTS Institute in Ludhiana? or at least looking to get 7 bands in IELTS ?